The Rugby Football Union should conduct a swift inquest into England's World Cup failure, former England assistant coach Mike Ford has urged. Ford, now head coach at Bath, was part of the management team at the 2011 tournament in New Zealand. And he says any fallout following the group-stage exit this time around should take place at once. "I hope it doesn't take a long time," Ford told BBC Radio 5 live. "The review should not last three months." Defeats at Twickenham by Wales and Australia ensured England became the first host nation not to progress to the knockout stages of a World Cup. Following their unsuccessful World Cup campaign in 2011, Ford - along with head coach Martin Johnson and fellow assistant coaches Brian Smith and John Wells - left his post, while critical player feedback was leaked to the Times newspaper. "You don't need any player feedback, because hopefully Stuart has been speaking to his captain and his leaders every day," Ford added. "So don't let the people involved go through that with their families, and have that kind of experience." 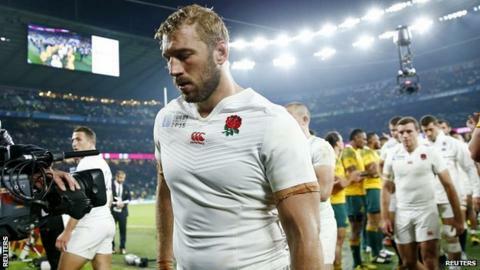 RFU chief executive Ian Ritchie has promised there will be no "knee-jerk" reaction, and says he will conduct a detailed analysis of why England were knocked out at the pool stage. However Ford has questioned why this needs to the case. "What are they trying to dig up?" Ford continued. "The facilities weren't good enough? The Denver trip wasn't good enough? They didn't have enough coaches, or strength and conditioning? The food wasn't right at Pennyhill? "All those things would have been meticulously planned anyway. So they know now." Former England centre Mike Tindall, captain in 2011, has also advised against protracted fallout over the next few months. "I hope not," he told 5 live. "I hate the fact there is always a witch-hunt after. "They have gone out, and have the tag of having the worst result England have ever had in a World Cup. That is going to burn any of those players. "Fans say there are hurting from it - I guarantee players are hurting a hundred times over." But despite the chastening World Cup campaign, Ford insists English rugby has the capacity to succeed at international level. "The Premiership is healthy, there are talented players out there," he added. "What we've always struggled for over the last 15 years is a team that can attack. "If we get that right, and the next coach coming in doesn't have any fear about losing his job, and about what the press say, then we can do very well." Hear more from Mike Ford on 5 live Sport at 19:30 BST on Wednesday. Paul Grayson and Andrew Mehrtens are among the studio guests.